Driving along Big Nickel Mine Drive and past the giant iconic landmark, it hits you, how much the scenery has changed. Green rolling hills have replaced giant black slag heaps. And then as you approach Valley East, fields are dotted with vegetable crops, cattle and other livestock. It’s remarkable – what has transpired in Sudbury over the last decade. Once upon a time we boasted about eating foods that travelled thousands of miles to our plate; the more exotic, the finer our palette, right? But now eating local is the biggest food trend. As a result it has changed our eating habits and food supply. And the restaurant scene. This global movement can be traced back to the release of the book 100-Mile Diet: A Year of Local Eating in 2007. In the book, authors Alisa Smith and J.B. Mackinnon reflected on one year of eating food only found within a 100-mile radius of their Vancouver apartment. The 100-Mile Diet was born. Consumers started showing more interest in local food systems, recognizing the environmental, economical and health benefits. It elevated the profile of farmers and producers to rock star status. Around the same time Verdicchio started shopping around for farm fresh products. Josephine’s Vegetables on valley View Road soon become one of our top picks. Little did we know at the time, but this family-run farm has grown produce without the use of herbicides since 1982. Flash forward to a morning in June 2017 when we found ourselves in Blezard Valley. We spent the morning at Triple Star Acres and Smart Greens – Sudbury, a verticle hydroponic farm. These two operations are vastly different; one incorporating state-of-the-art technology and the other natural farming methods. But they share a common philosophy and goal – to utilize organic and natural practices to provide Greater Sudbury with fresh products. 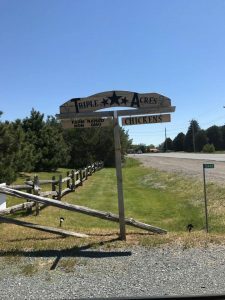 The couple purchased the farm eight years ago, clearing and preparing the 80 acres of property by hand. They use black plastic mulch in their crop fields to control weeds, warm the soil and reduce disease. They say their crops are about two weeks ahead of most other farms in the area. 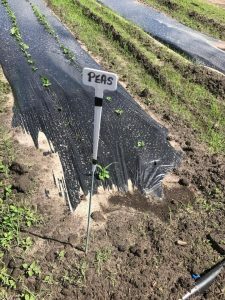 Within a few weeks they will have tomatoes, cucumbers, peppers, peas, beans, broccoli, cauliflower, carrots and potatoes. They also have two varieties of garlic – Music and Rocambole. Ginette and Pete are hardworking, innovative farmers who share some of our same values –and the kind of like-minded people we want to align ourselves with.